Fundraising Events - and more! Ensemble Suavis is a versatile, professional group of musicians providing beautifully played music, at competitive rates, to enhance any occasion. From a duo to a large ensemble, instrumentalists may be provided according to your needs: see below for instrumental combinations available. All members of the group are experienced and highly trained musicians and performers. Ensemble Suavis can provide a repertoire list, sound clips on CD or as email attachments, and guidance on the best option for your own event. Contact for further details or call 07790 255769. We hold a Public Liability Insurance certificate for public events. We can perform any of the most requested classical works: for example Pachelbel's Canon; Jesu Joy of Man's Desiring, or any of the popular wedding marches. We are based in London but are happy to travel throughout the UK and even further afield. A pianist (with their own portable piano and equipment, if necessary), as a soloist or with other instrumentalist(s) in a duo or trio. Venues in which the group has played include Tate Britain art gallery, the Foundling Museum, the Orangery Gallery in Holland Park, and the Old Royal Naval College, Greenwich. The musicians are able to provide background music, incidental or processional music for a ceremony, or repertoire for a concert. Repertoire is carefully chosen in discussion with the client. We play a wide range of music including classical, folk melodies, jazz-inspired music, popular songs and film/tv themes. Selections can be made within a particular style or we can provide something for everyone - just let us know your requirements. For an oboe/piano sound clip, please click here. 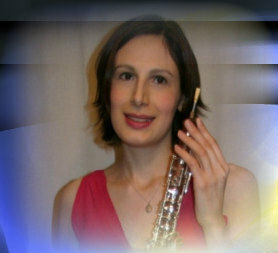 Julia White can perform unaccompanied on oboe or cor anglais, or may be accompanied by piano or organ. Please see the repertoire page for ideas, and scroll to the bottom for wedding repertoire. For rates, please contact using the enquiry form. "Today I heard Ensemble Suavis playing at Canary Wharf. It sounded lovely...the Suavis ensemble was excellent" Emily Williams (age 14) who took the trouble to email us - thanks Emily! Thank you very much for the wonderful performance you gave - our members had an enjoyable event. We hope to be able to welcome you back to Phyllis Court Club in the near future.